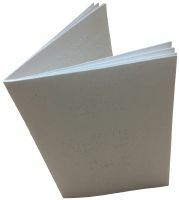 Include Braille Rules on How to Play Checkers for $5.00? A smaller, more compact version of checkers. Wood game board is less than 6" square. Features painted wood pegs, with a dot on the red pieces. Just flip your piece over when you make a king. Easy to carry, and perfect for trips or hikes. Stored in convenient, compact wooden box. Measures about 5-1/2 in by 5-1/2 in by 1-1/4 in. Package Weight: about 9.5 ounces. 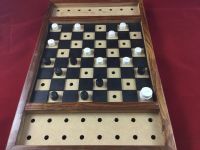 Well, if you're used to playing games by touch, and think you'd like a smaller, more compact version of Checkers, this might just be what you're looking for. 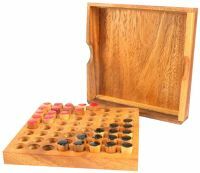 The wood game board is less than six inches square, and when stored in its convenient wooden box, stands just over an inch tall. The pieces themselves are painted wood pegs, with a dot on the red pieces so you can tell your checkers apart from the bad guys. If you're lucky enough to make a king, just flip the peg over - a new color and a tactile notch will set aside this powerful piece from its lowly neighbors. Lots of fun, easy to carry, and perfect for trips or hikes where there's little room, this travel version is sure to be a hit with the whole family. The origin of the Checkers board game is rather uncertain. There are 13th century paintings that depict a checkered board, which leads historians to suspect that checkers may have been invented around 1000 AD. Most people think the baord game probably originated in the south of France and Spain, though there are also traces of checkered games in the middle east. The game of Checkers, also called Draughts, is played on a board of sixty-four squares of alternate colors, usually referred to as black and white. 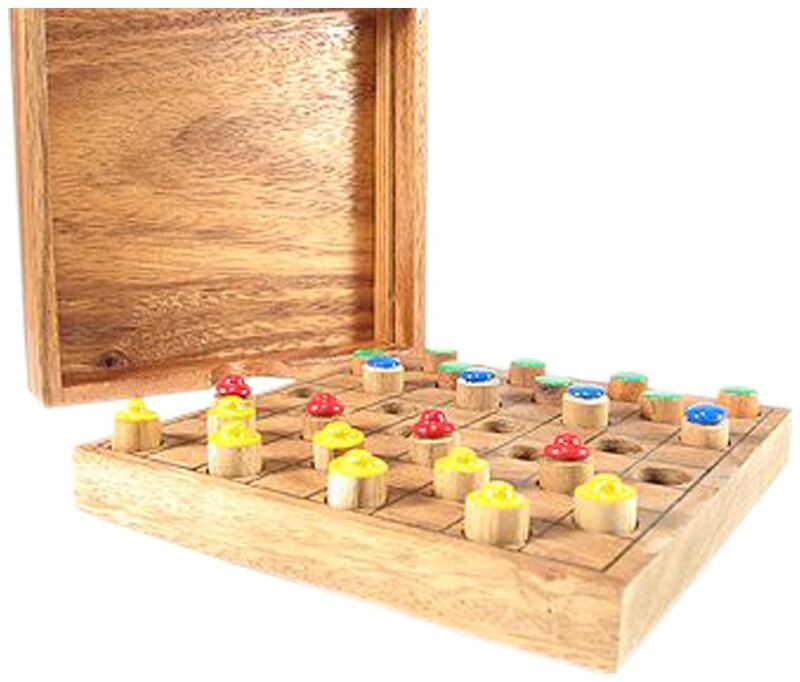 Twenty-four pieces, called men, also of opposite colors, are located on the game board. The game is played by two persons, and each player takes a set of twelve men. The object of the game is to capture all of the opponent's men, or block them so they cannot be moved. The person whose side is brought to this state loses the game. The checker board must be placed between the two players in a position where the bottom-left square is black. The players toss a coin at the beginning of the match, and the winner has the choice of taking the black or white pieces. Then each player places his twelve men on the black squares of the first three rows of his end of the board. The player with the black men must move first. Players alternately take turns, each moving one piece of their own color. The checkers are moved diagonally forward, left or right, one square at each turn. An opponent's piece is capture or taken when the player is able to diagonally jump forward one of his men over an opponent's piece and land on an empty square behind. The player may continue jumping and capturing pieces with the same man during the same move if possible. When a piece reaches the last row on the opposite side of the Checkered Board, it is crowned and becomes a "King." A King can move diagonally forward and backward, and also has the power of capturing pieces in both directions. Our Classic Checkers set has four wider, taller pieces to serve as kings. If you're playing with our Travel Checkers set, just flip over your peg to crown it: the other side has a tactile notch and a different color. A Draw occurs when neither of the players can force a win.